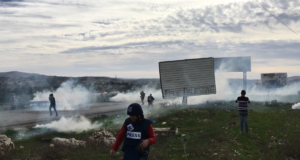 Over 100 Palestinians and international activists were attacked by Israeli soldiers with tear gas and sound bombs as they attempted to march to the evacuated Israeli settlement Homesh from the village of Burqa, near Nablus, on Friday 14th November. 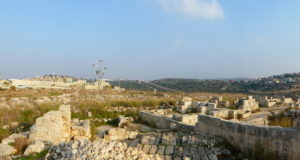 The villagers and internationals intended to enter the settlement, which was evacuated by Israeli authorities in August 2005 as part of the so-called Israeli “disengagement plan”, in order to plant trees inside the grounds of the former settlements – lands which legally belong to Palestinian villagers. The tree-planting was to symbolise a reclamation of the land, which, though evacuated, has not been returned to its legal owners, and remains under Israeli military control. Demonstrators carried placards that read: “We will not allow the nightmare of Homesh back again!”, referring the high-levels of violence enacted by settlers before Homesh was evacuated, and is continued by settlers who visit and attempt to re-occupy the land. This is exemplified by the recent burning of more than 500 olive trees by Israeli settlers at the beginning of this year’s olive harvest; as well as by attacks on shepherds and their livestock which continue despite the settlement’s evacuation. The demonstration was prevented from reaching the evacuated settlement, however, by Israeli military and police, who immediately threw sound bombs and tear gas into the non-violent crowd, burning two people. After initially fleeing, the villagers returned to stand their ground, refusing to be further intimidated, despite constant threats from Israeli soldiers. Instead, they chanted: “They steal our water and we are thirsty” and “Settlements are the death of our land”, demanding an end to the settlements and the occupation which enables Israeli settlers to steal Palestinian land. Villagers were also demanding the removal of the military checkpoint near the entrance of the settlement, which denies Palestinians freedom of movement. 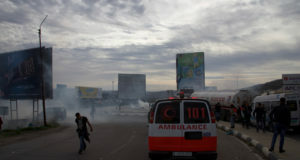 After speeches from representatives from a number of the surrounding villages who were participating in the demonstration, as well as the Nablus governorate office and various supporting organisations, the crowd began to disperse, at which point the Israeli soldiers again started to fire tear gas into the crowd. Villagers were not deterred from their struggle by this use of violence by the Israeli army. One local youth remarked “We don’t have guns to fight the army, but we have big hearts for our land”. Other villagers noted that it was particularly ironic that they were not allowed to enter the evacuated settlement, as it was alleged that an Israeli settler had entered the settlement the night before and erected a tent in which he had slept the night. Villagers claim he was still inside whilst the demonstration took place. Many Palestinian villagers from the region are concerned that the lands will be permanently re-occupied by settlers. The villagers, however, are determined to continue their struggle, committing to regular demonstrations against the military occupation of their lands.